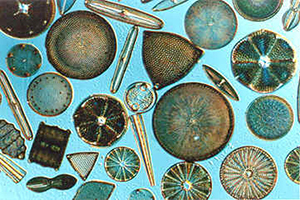 Diatoms, one of the most common types of phytoplankton, are microscopic food power cells. They convert nitrogen, phosphorus and carbon dioxide into oxygen-rich organic compounds that create a healthy ecosystem in your pond. The structure of diatom algae differs from that of cellulose-based algae like blue and green algae in important ways. Blue and green algae reduce photosynthesis in your pond, which harms the zooplankton and fish. Diatoms are photosynthesizing algae with a silica-based skeleton. Unlike blue and green algae, which form a layer on top of the water that cuts off light, diatoms are free-floating algae which sink to the bottom where they are eaten by zooplankton – and then the fish in your pond feed on the zooplankton. By feeding those essential diatoms, Nualgi Ponds balances the natural marine food chain—and provides a zooplankton buffet for your fish! ← Why Grow Diatom Algae?